Due to term limits our Developmental Disabilities community is losing two of its greatest champions in the State Legislature, Senator Fran Pavley and Senator Carol Liu. 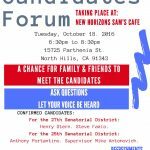 For this reason I am personally asking that you not only attend but also help us get the word out about our upcoming Candidates Forum taking place at New Horizons in Sam’s Café tomorrow, October 18, 2016, from 6:30PM to 8:30PM. We are located at 15725 Parthenia Street, North Hills, CA 91343. Are the candidates asking for our votes to fill their seats aware of the Senators’ legacy? Do they know how the decades of funding cuts and freezes have hurt community services and reduced options for people who depend upon those services? How highly do they prioritize the needs and best interests of people with developmental disabilities in their districts? When “push comes to shove” will they stand up to Governors and party leaders on our behalf? We have only one chance to find out the answers to these questions and more before we vote in November. The finalist candidates for these critical seats have accepted an invitation to participate in a forum to discuss these issues including answering questions from the audience. If you or a loved one has a stake in the future of services for people with developmental disabilities you are encouraged to make arrangements to attend this important event at Sam’s Cafe. The Candidates Forum is for the California Senate. Confirmed participants include Henry Stern and Steve Fazio, Candidates for the 27th Senatorial District, and Anthony Portantino and Supervisor Mike Antonovich, Candidates for the 25th Senatorial District. To RSVP and ensure your space at this event where refreshments will be served, please email Siwahashi@nlacrc.org. 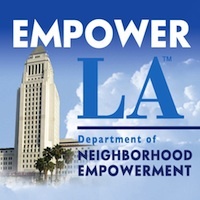 For more information click here, or contact New Horizons at 818-894-9301.